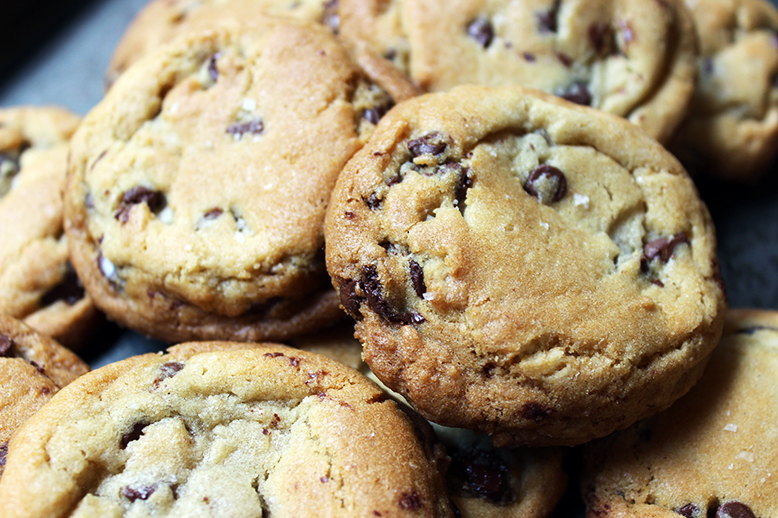 Jacques Torres Chocolate Chip Cookies may be some high maintenance cookies, but you will NEVER taste a better cookie. EVER. Really, EVER. 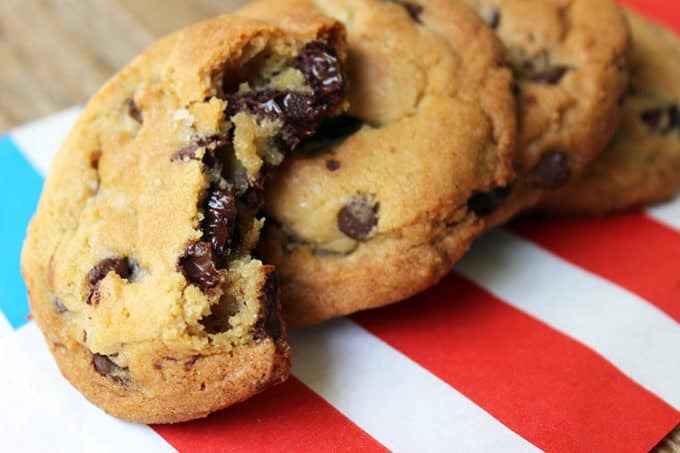 Jacques Torres Chocolate Chip Cookies are the best cookies you will ever try. EVER. I want you to understand, I am not a person who normally exaggerates. I like to avoid blanket statements or proclamations because you just never know. In this case? I know. 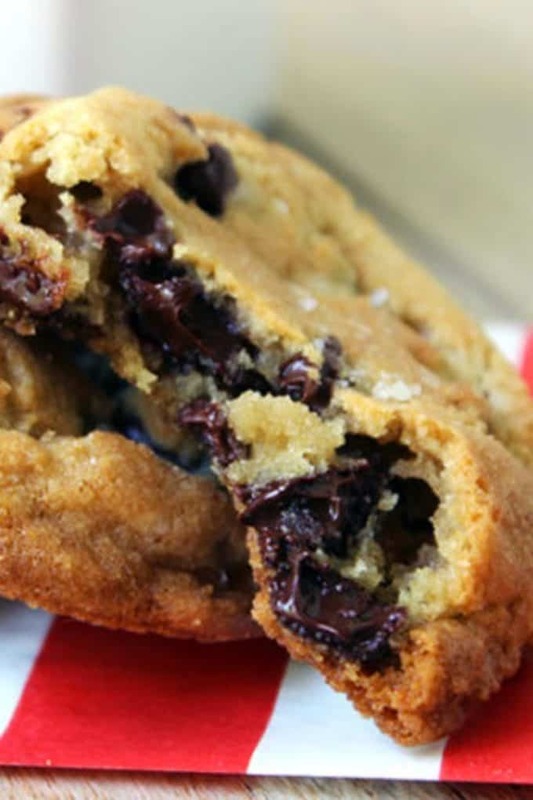 Also happy National Chocolate Chip Cookie Day! 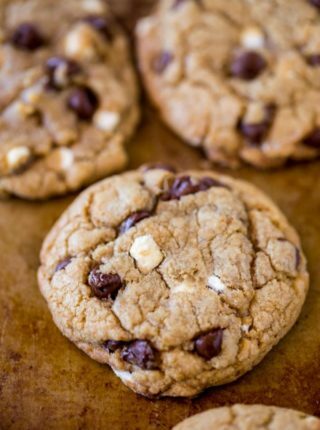 These cookies are crispy on the outside, chewy on the inside with a hint of Maldon Sea Salt on the tops. 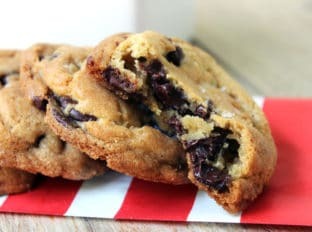 The buttery cookie flavor filled to the brim with bittersweet chocolate feves, you won’t even want to drink milk with them because the only flavor you will want in your mouth are the flavors of this delicious cookie. As I am sure you can imagine, the best things in life aren’t necessarily the easiest. This recipe uses cake and bread flour in place of AP flour. It uses bittersweet chocolate feves instead of your regular chips. You can absolutely use chips, just use bittersweet ones. The feves are simply flat circles of chocolate so they make more layers of chocolate goodness in the cookie. The biggest difference from any recipe you have likely tried before? The time you let these cookies rest. 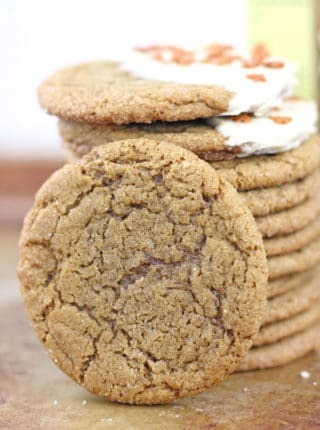 I personally let them rest 36 hours (24 hours really being the minimum you should wait) and like a fine wine, these cookies really age wonderfully! Before I lose you at “36 Hours” let me go a bit further into detail about this resting period. 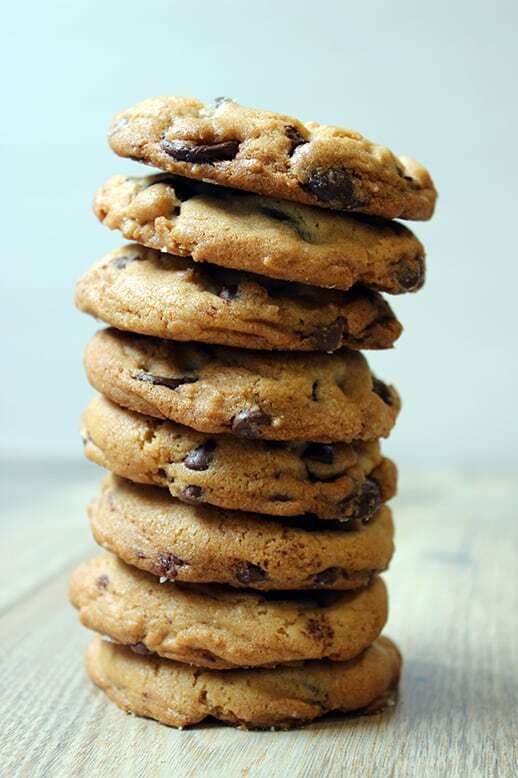 The science behind these cookies and the resting period is that the butter in the recipe (and in any chocolate chip cookie recipe) coat the flour. In the related link the NY Times actually goes into the science of how butter is a natural sort of force shield, preventing the flour from absorbing the eggs properly. The extra time in the fridge allows for the wet ingredients to fully meld with the dry. It turns out even the original Nestle Cookie 1930’s recipe said to rest overnight! This detail is left off the recipe on the bag, probably because most people won’t want to wait that long for cookies. Have I waxed poetic long enough? Try them! PLEASE! I mean it, try them and come back to tell me what you thought of them. Just please make them exactly as written the first time. And give them the time to mature… it really does make all the difference. Am I enticing you enough with these photos yet? If not let me know, I love these cookies so much I took almost 200 photos of them for this post. I could make a brag book for them. Add the eggs in one at a time, making sure they are mixed in well after each one. Don’t worry about over-mixing yet, there is no flour in the bowl. Add in the vanilla. Lower the speed and add in the flour mixture for just a few seconds until it is mixed in. This is when you should worry about over-mixing. Add in the chocolate fèves and mix carefully with spatula to prevent breakage. Take the bowl off the stand mixture and cover the dough with plastic wrap as if it was a guacamole. 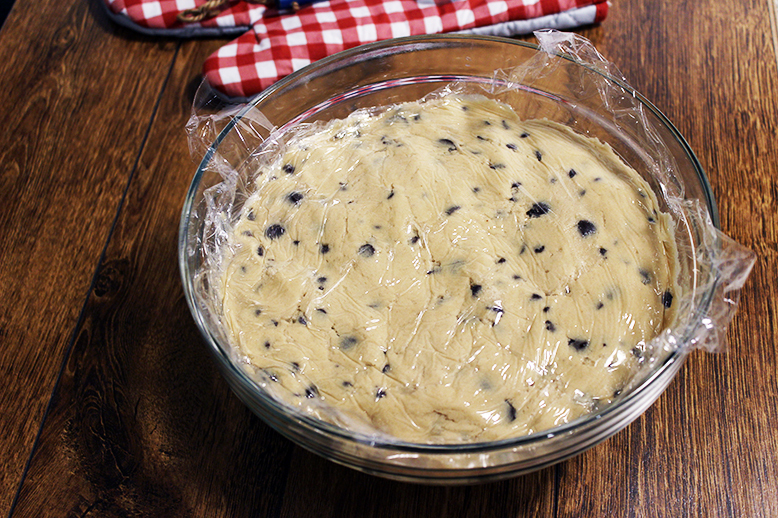 Letting air get to the dough will dry it out in a bad way. Refrigerate for 36 hours. Technically you could for 24, but trust me go for 36. Preheat your oven to 350 degree F or 176C. Using a 2 tablespoon scoop, put them onto a baking sheet. Sprinkle the tops with sea salt. I love and used Maldon Sea Salt. Bake for 11-13 minutes. Let them cool for 5-10 minutes. Best enjoyed warm. This made 55 cookies for me, 39 of which we froze for later use! It is the gift that keeps on giving. 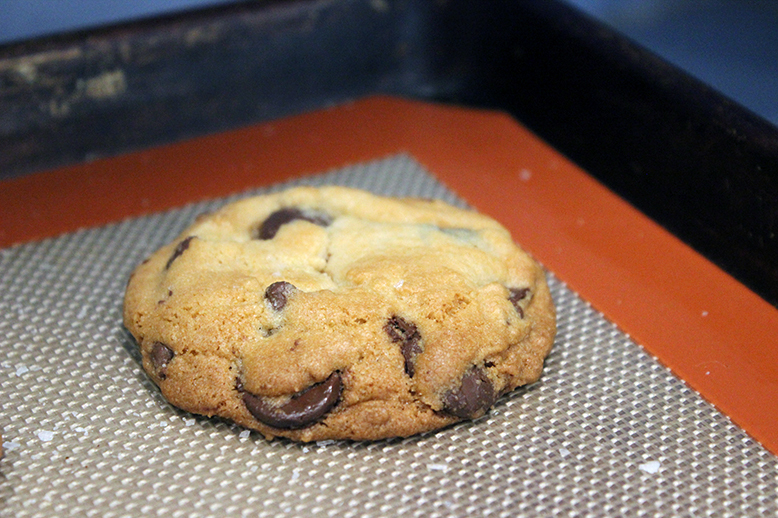 Alternately, here is text from the original recipe for larger cookies: Scoop 6 3 1/2-ounce mounds of dough (the size of generous golf balls) onto baking sheet, making sure to turn horizontally any chocolate pieces that are poking up; it will make for a more attractive cookie. Sprinkle lightly with sea salt and bake until golden brown but still soft, 18 to 20 minutes. 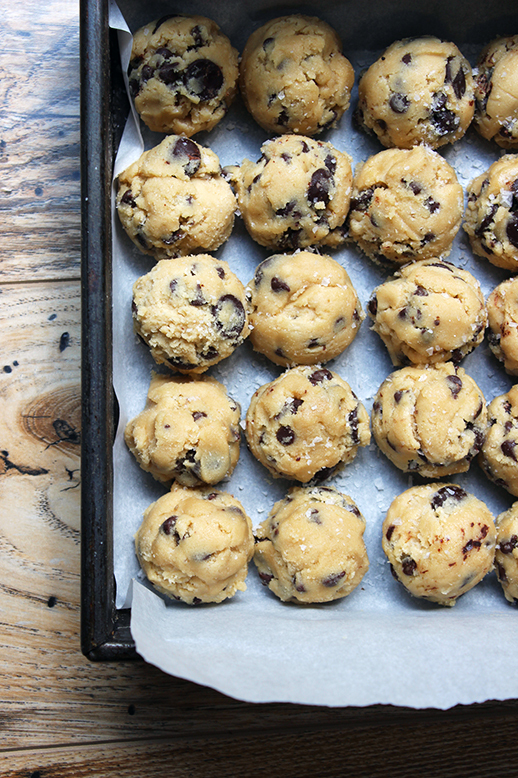 Want to eat some chocolate chip cookie dough while baking these? 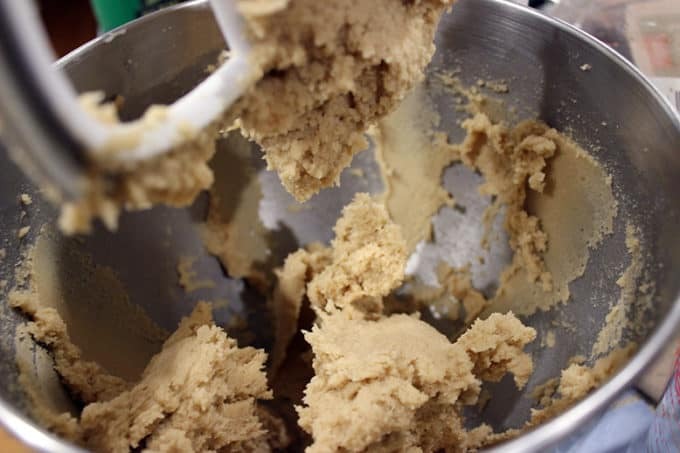 Try this Chocolate Chip Cookie Dough recipe! It is a great snack while you’re baking! Maldon Sea Salt: This is the perfect flaky finishing salt, once you start using it, you’ll be a total convert. AND it is inexpensive! Bread Flour: Helps with the chewy qualities of the cookies. Cake flour: Helps with the tenderness of the cookies. Silpat: Keeps the bottoms of the cookies from burning, this silicone mat is a lifesaver. 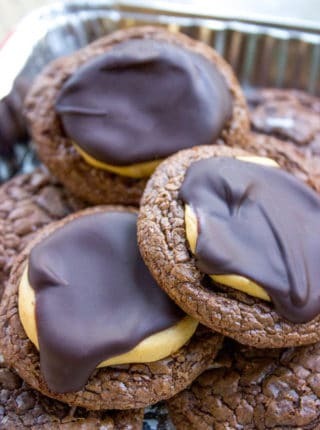 Bittersweet Chocolate Feves: These unique shaped chocolate disks make the perfect layers throughout the cookie and melt perfectly. In a bowl, combine the two flours, baking soda, baking powder and salt. 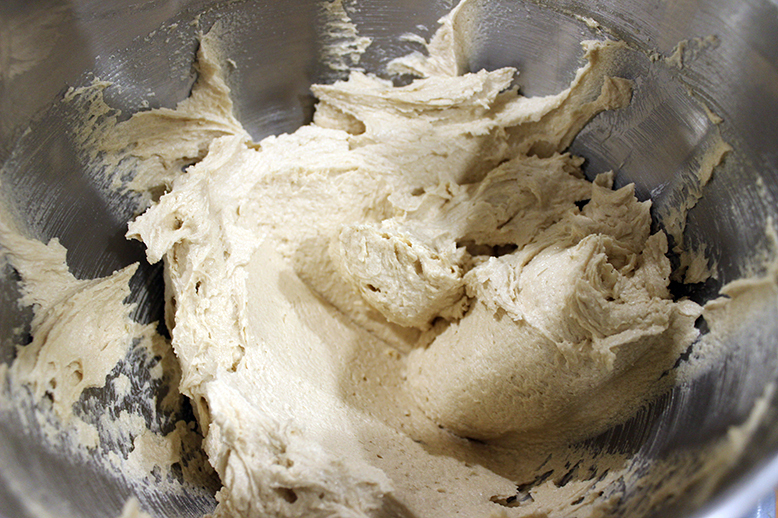 Using your stand mixer, cream the butter and sugars together for 5 minutes. You want the mixture to be significantly lighter than when you started. Add the eggs in one at a time, making sure they are mixed in well after each one. Don't worry about over-mixing yet, there is no flour in the bowl. Add in the chocolate fèves and mix carefully with spatula to prevent breakage. Refrigerate for 36 hours. Technically you could for 24, but trust me go for 36. Preheat your oven to 350 degree F or 176C. Using a 2 tablespoon scoop, put them onto a baking sheet. Sprinkle the tops with sea salt. I love Maldon Sea Salt. Let them cool for 5-10 minutes. I wanted to say thank you so much for posting this recipe. 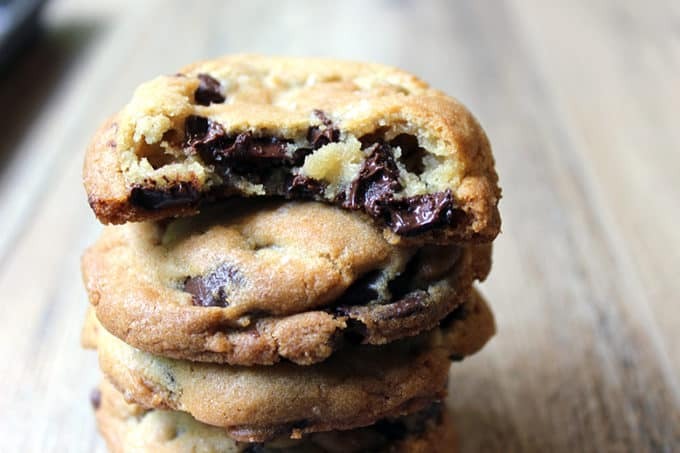 I’ve been on the search for a good choc chip (just made Alton Brown’s – wasn’t quite right) and this one is truly perfect. I feel like I’ve just been gifted a family heirloom! I did make two changes – I ran out of cake flour, so I substituted all purpose with a tablespoon of cornstarch, and I chopped up 70 percent dark Lindt bars instead of disks. But everything else stayed the same. I did sneak bake a cookie after 30 minutes of resting but found the flavor to be one dimensional compared to the full rest. Definitely benefits from the full 36 hours. I’m so glad you love it! I know it’s so hard to wait but glad you found that it was well worth it. Also made these as a bday gift for my superstar of a little brother. He shared them around the table and EVERYONE loved them. How awesome! So glad everyone loved them. In the list of ingredients, it says: 1 ¼ pounds bittersweet chocolate disks or fèves at least 60 percent cacao content (see note). Where is or what is the “note” we are supposed to refer to? Sorry for the confusion. The “note” is actually referring to the “tools used” section. I linked the Bittersweet Chocolate feves that I used. Is the dough supposed to stay soft during the resting period? It’s refrigerated during the resting period so it will get firmer. 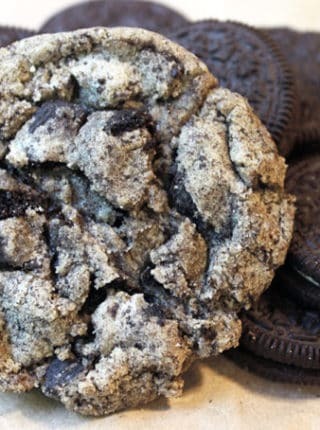 This is the best chocolate cookie recipe EVER!! I picked 4 recipes this year and hands down this was by far the best one -I chilled the dough for 30 hours! Super delicious! and oddly, after I made the dough, I made 3 practice cookies just to see how they bake without resting. the flavor was amazing. Even better before (I think) than after letting it rest. Question about baking times. I was using a friends commercial convection oven. If you make the cookie smaller, how much time do you usually adjust it? I sense I might have overcooked it just slightly by not reducing time for the portion you called for. Although they didn’t look done, they were still slightly crisp. Every oven is different so really only you would know by looking but I would say if they’re smaller, start checking 2 minutes earlier. I’ve been having trouble finding feves. Finally did. However, I made the dough without the chocolate and it’s been in the fridge for 48 hours. Can I take the dough, add the chocolate, then bake? Will the 48 hours negatively affect the cookie – or adding the chocolate just before cooking? I’ve never tried it but I would think it would still work. I’d love to know how it turns out, thanks! Hi, Must you let the cookies come to room temperature after refrigerating? No, you still want them cold. Thanks for the recipe (especially for including the weights of the ingredients!) What temperature, and how long did you bake the frozen balls for? If you are baking from frozen, I would say give them 1-2 extra minutes in the oven and yes at the same temperature! (and watch them like a hawk the last minute to make sure they don’t over-brown. ?